Eleventh month of the Islamic Calendar. Meaning: Taken from the word “qa’ada” which means to sit. This is the third sacred month in which fighting was forbidden. The people also used to stop their business activities during this month and sit and prepare for the Hajj (Pilgrimage). This is also a sacred month. 1. The battle of ‘khandaq (trench) or Ahzab’ took place in the year 5 A.H.
2. In the year 6 A.H.-Truce of Hudaubiyah. 3. In the year 6 A.H ‘Bay’at-e-Rizwaan’ (The oath of allegiance named Rizwaan). 4. The return to Makkah for Umrah by Holy Prophet and his Companions in the year 7 A.H.
Click on above mentioned Islamic Months names list to find Islamic events historically which happened in Islam. 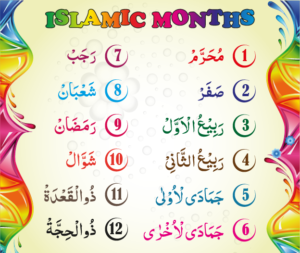 And having some knowledge about importance of Islamic Months in order to get more benefits.